Marvel published several trades and omnibuses reprinting classic issues under the Women of Marvel banner (including the volume where I read a previous Ink Ladies subject, The Cat, for the first time), but their output wasn’t limited to repackaging old comics. Also hitting the stands were several female-led titles, such as Marvel Her-Oes and Heralds (mercifully not spelled “Her-Alds”). Though those titles have already faded from memory in just five years, Marvel also published a significant three-issue anthology miniseries: Girl Comics, the first Marvel comic series produced completely by female creators. Girl Comics not only boasted contributions from comics creators as lauded as Jill Thompson, Emma Rios, Ann Nocenti, and Ming Doyle, but the series would also be colored, lettered, and edited by women. If any book published that year was going to embody the stated goal of the Women of Marvel project and celebrate female characters and creators, it was going to be Girl Comics. “I wanted to spotlight the fact that these women are working for us or they’ve been working in superhero comics or they have a love for superhero comics and they do their own stuff,” said Girl Comics editor Jeanine Schaefer, when talking about the series to USA Today. Though the project had admirable intentions, there were detractors—one big cause of contention the comic’s name itself, which was taken from an old Timely/Atlas book in the 1940s. I do find the title Girl Comics to be somewhat patronizing to my modern ears, but at least it doesn’t have a rejected breakfast cereal title like Her-Oes. Another concern was that the book would further “ghettoize” female creators in the industry, an idea that Ann Nocenti rejected in the same USA Today article. (However, it’s worth noting that of the book’s dozens of writers and artists, only a small number—including G. Willow Wilson, Kelly Sue DeConnick, and Sara Pichelli—are still making comics for Marvel as of this writing in 2015.) I don’t love every story in this miniseries, but I’m glad it exists. Anthology comics are often a strange beast, especially if they’re published by the Big Two. Marvel anthology comics often don’t feel like ordinary Marvel comics, if only because the shorter formats can lead to more experimentation, more goofing off, and stories that wouldn’t fit in a regular serialized comic. 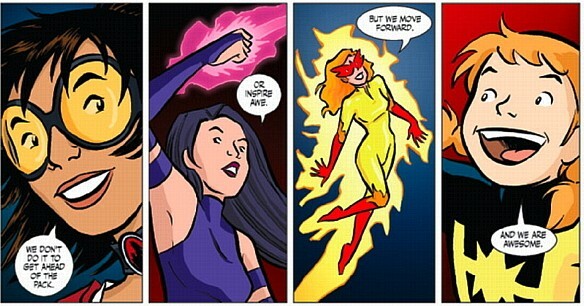 Girl Comics does not have an overarching theme; most stories feature female characters, but some do not. At its best, Girl Comics feels like a passion project, with the creators choosing which characters and genres interested them, though occasionally the mix of humor, drama, and action can feel unfocused. The one thing that unites all three issues is their introductory pages by Colleen Coover, which when read together forms a kind of cheery, superheroic motivational poster starring dozens of Marvel heroines. 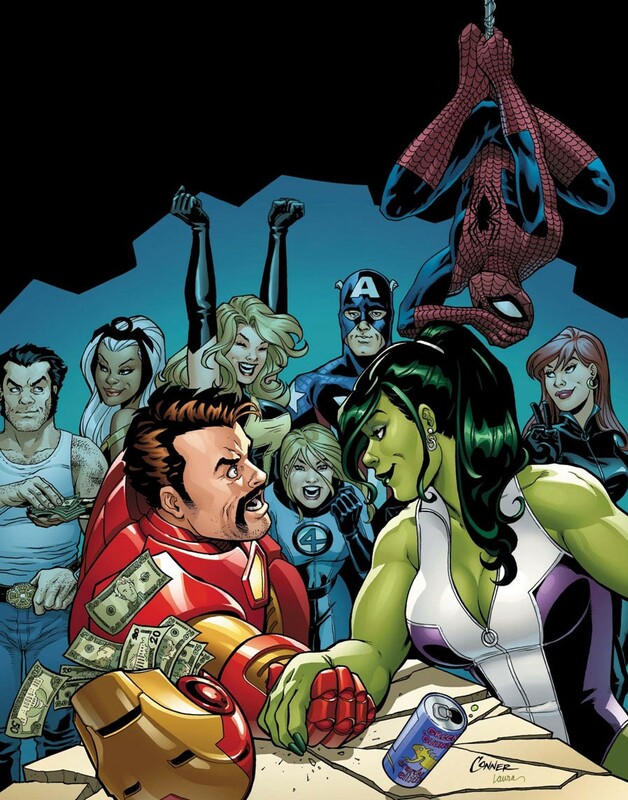 “We do it because it’s fun,” says She-Hulk, celebrating her 30th anniversary by gleefully smashing evil robots. One of the joys of short comics is seeing familiar characters distilled down to their purest, most essential selves. “Moritat,” by G. Willow Wilson and Ming Doyle, is a straightforward adventure tale in which Nightcrawler saves a cabaret singer from a knife-wielding attacker. Doyle’s artwork gives the setting and characters a smoky sensuality (has Nightcrawler ever looked more handsome, or dashing?) and it’s an efficient, well-told story about Nightcrawler’s heroic nature shining through his seemingly demonic appearance. Devin Grayson and Emma Rios put an intriguing spin on the Cyclops/Phoenix/Wolverine love triangle in “Head Space,” focusing on Jean and Scott’s psychic link. 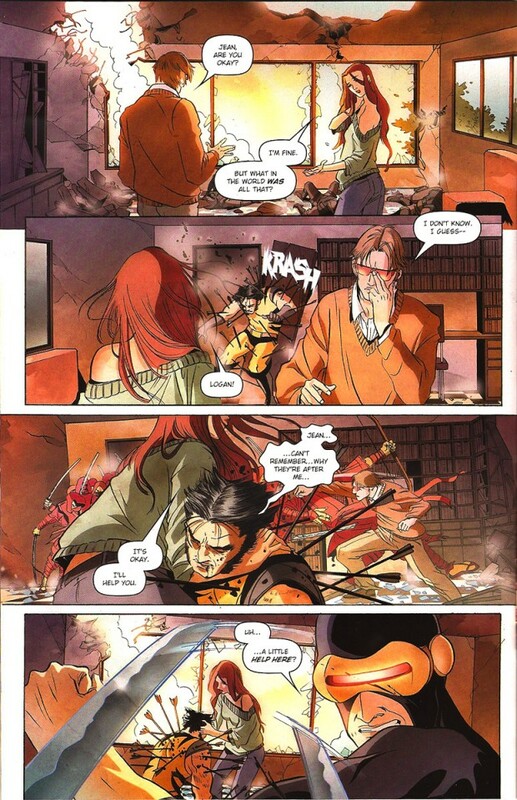 Scott’s insecurities about Wolverine begin to take physical form, spilling violently out of control until Jean can talk him down. It’s a beautifully drawn comic about love, jealousy, and psychic powers, and made one of the oldest love triangles in comics feel fresh and exciting. Girl Comics is also successful when it eschews superheroics entirely in favor of character-driven slice of life pieces. In “Mixology at Terato Gena’s,” Carla Speed McNeil tells the story of Kitty Pryde’s 21st birthday party. The short comic is deceptively simple—Kitty gets drunk and can’t control her phasing, Thing bets on just how much Wolverine can drink—and in a regular Marvel comic, this would be when Juggernaut crashes the party. Instead, the story is imbued with gentle humor, wry, expressive characterization, and a hell of a lot of superhero cameos (hey, Dead Girl!). Jill Thompson’s painted artwork in “Dogged Pursuit” makes the Inhumans’ home of Attilan look like a magical storybook kingdom, which gives the familiar story of a girl trying to give her dog a bath (here, the girl is Crystal, and the very, very big dog is Lockjaw) a fairytale quality. For some creators, Girl Comics presented an opportunity to return to the Marvel characters they created. In “Blindspot,” Ann Nocenti returns to one of her most well-known creations, Typhoid Mary, whose night out at a bar turns violent when her alternate personalities vie for control. Mary Crabapple’s soft, rounded artwork is atypical for superhero comics, but when Typhoid Mary lets loose and forms a dress made out of flying kitchen knives, she looks powerful and frightening. Louise Simonson writes a crossover between two of the big titles she wrote in the 1980s, Power Pack and X-Factor. The Power siblings need to raise money to buy their mother a birthday gift, so they take a babysitting job. But when the baby is Christopher Nathan Summers, Cyclops’ son, you know this isn’t going to be a typical gig. Reunited with Power Pack co-creator and artist June Brigman, Simonson crafts a fun story for anyone nostalgic for the Power family, or whoever just wants to see Cable as a snot-nosed baby. As is common with anthologies, there are stories that struggle with length and space; some drag on too long, while others are simply too ambitious for their limited page count. “A Brief Rendezvous” by Valerie D’Orazio and Nikki Cook is a one-joke story stretched out over four pages. When the first page ends with the kicker that a creepy, circus-obsessed sexual predator isn’t going to meet “sadprincess14,” but rather The Punisher, the three mostly-silent pages that follow are redundant. As soon as the reader sees The Punisher, we immediately know how the story’s going to end. We chuckle darkly, and move on. “Good to be Lucky,” about the obscure Contest of Champions character (and awkward cultural stereotype) Shamrock, is charming but overstuffed. Kathryn Immonen not only reintroduces Shamrock, who has retired from superheroics to open a salon, but also tries to cram a “girl power” lesson for Black Cat’s sulky niece, an attack from Paste Pot Pete, and the gray, Little Orphan Annie-eyed poltergeists who haunt Shamrock, into a measly eight-page story. Despite Colleen Coover’s amiable, always pleasant artwork, Shamrock’s luck powers aren’t enough to make the story succeed.